French bistro diners are partial to having their steaks a little on the chewy side but very flavorful. For that type of steak, you want bavette flat iron, hanger or flank steak. 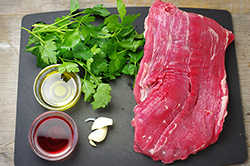 Bavette, cut from the flank, can be found at specialty butcher shops or online at Niman Ranch. 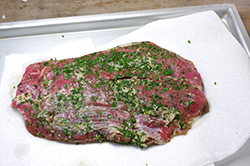 The flat iron steak is cut from chunk. Hanger steak, also cut from the flanks is actually a whole muscle and is chewier than flank steak; it’s known in France as onglet. 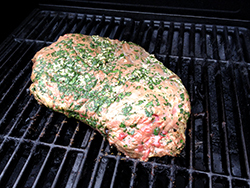 You need to tenderize these steaks either by marinating them for at least an hour (preferably 8 hours) or pounding them with a meat tenderizer or mallet. Then you grill them over a hot fire to medium-rare. The final crucial step is slicing them properly to serve. Cut the meat against the grain, on the diagonal, holding your knife at a 45-degree angle (so it’s slanted, not straight up and down). 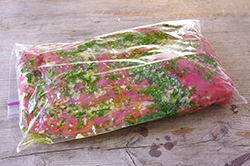 For the Bavette Marinade, place the ingredients in a sealable plastic bag. Add the steak, seal the bag, and coat the steak with marinade. 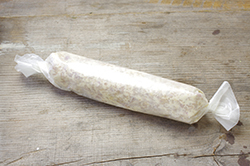 Refrigerate for at least 1 hour or up to 8 hours. Remove the meat from the marinade and pat dry. Season with salt and pepper. 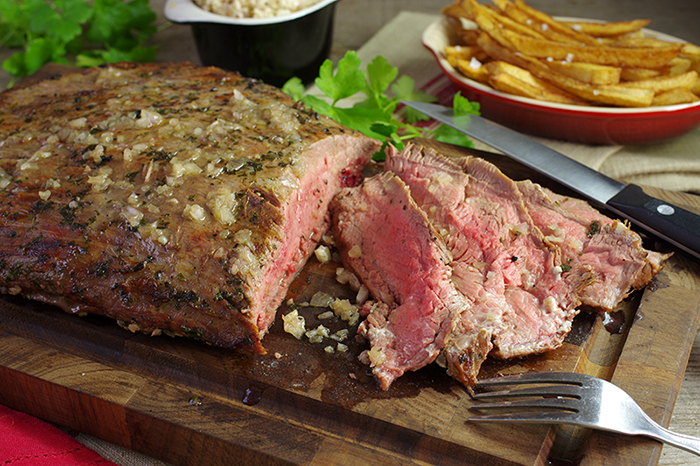 Grill for 2 to 3 minutes per side for medium-rare. 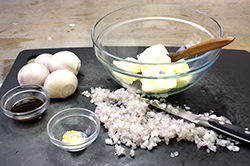 Remove to a platter and dot with half the Shallot Butter. Tent the meat with foil and let rest for 5 minutes. Cut against the grain, on the diagonal and at a 45-degree angle, into slices about 1/4 inch (0.5 cm) thick. Serve warm with the remaining Shallot Butter, Homemade Frites, and watercress. Begin with 1/2 cup (113 g) of unsalted butter at room temperature. 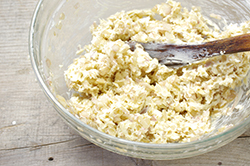 Add 6 finely chopped shallots or green onions, 1 teaspoon Worcestershire sauce, and 1/4 teaspoon dry mustard. Basically, these are homemade French fries, but they sound better as frites, don’t they? On bistro menus, you’ll often find mussels and thin, chewy steaks served with frites. 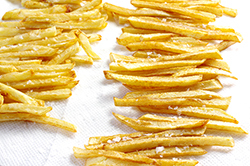 The secrets to great frites include cutting them thin and keeping the oil at or around 350°F (180°C). A deep fryer is great, but you can also use an electric skillet or a deep skillet and a candy thermometer. 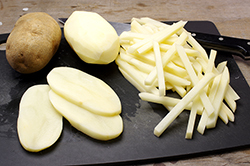 Cut the potatoes lengthwise into 1/4-inch thick (0.5 cm) slices, and then cut each slice into 1/4-inch-wide (5 cm) strips. 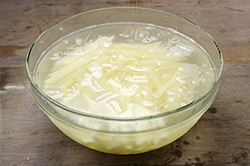 Place the strips in a bowl of ice water for 15 minutes. Drain the water from the potatoes and pat very dry with paper towels. Add 2 inches (5 cm) of vegetable oil to a deep fryer or skillet. If using a skillet, place over medium-high heat. When the oil reaches 350°F (180°C), place half the potatoes in the hot oil and cook, turning if necessary, until the potatoes turn golden brown, 5 to 7 minutes. Transfer to paper towels and season with salt. Keep warm in a low oven 200°F (100°C) while you prepare the second batch. Serve immediately. Season the frites with Rosemary Salt or Fennel Salt for a savory twist. Some frites aficionados swear by double frying the potatoes. To do this, fry them the first time as above and drain on paper towels. Then fry them again for a few minutes until light golden brown. Keep warm until ready to serve them or serve them right away.